1984 score by Roger Limb and The BBC Radiophonic Workshop, compiled and mastered by Mark Ayres and commercially made available for the first time. Poet Laureate John Masefield's classic 1935 fantasy novel was adapted by the BBC and broadcast in six parts between 21st November and 24th December in 1984. The story of a young schoolboy whose ownership of a magic box allows him to shrink, fly, revisit the past and experience incredible wonders and creatures inspired ambitious special effects and scooped three BAFTA awards, one for best children's series and two for television craft. 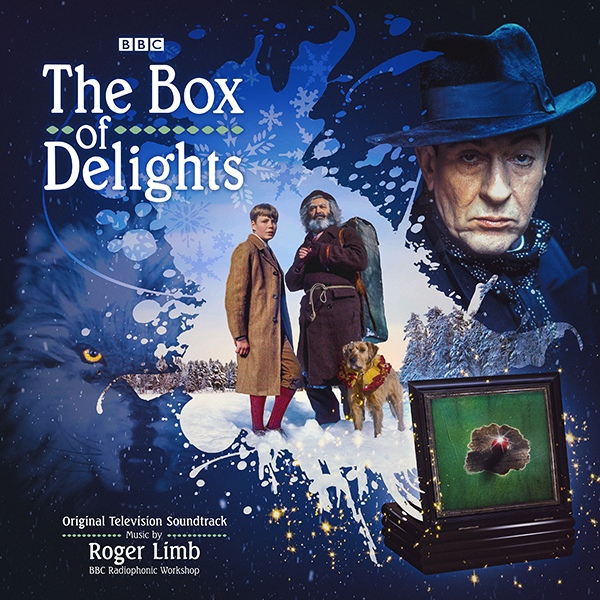 Starring Patrick Troughton and Robert Stephens and filmed in a variety of scenic locations in the UK at a cost of £1 million, The Box of Delights proved to be the most expensive children's series to date in the history of the BBC. Composer Roger Limb, a specialist in electronic music and working with The BBC Radiophonic Workshop is famed for his Doctor Who work. His range extends much further than science-fiction and includes Martin Luther: Heretic and the Look And Read serials. Much like the visuals the music matches with a truly innovative score combining acoustic instruments with synthesised sounds. Included on this release is the delightful original theme, Victor Hely-Hutchinson's Carol Symphony: Andante quasi lento e cantabile performed by the Pro Arte Orchestra.